AMSTERDAM, 13 SEPTEMBER, 2013 – RTW, a leading vendor of visual audio meters and monitoring devices for professional broadcast, production, post production and quality control, is pleased to debut at IBC 2013 (Stand 8.D92) its LQL (Loudness Quality Logger) a new tool for logging, true-peak data analysis and reporting that is compatible with the TM7, TMR7 and TM9 TouchMonitor line of products. 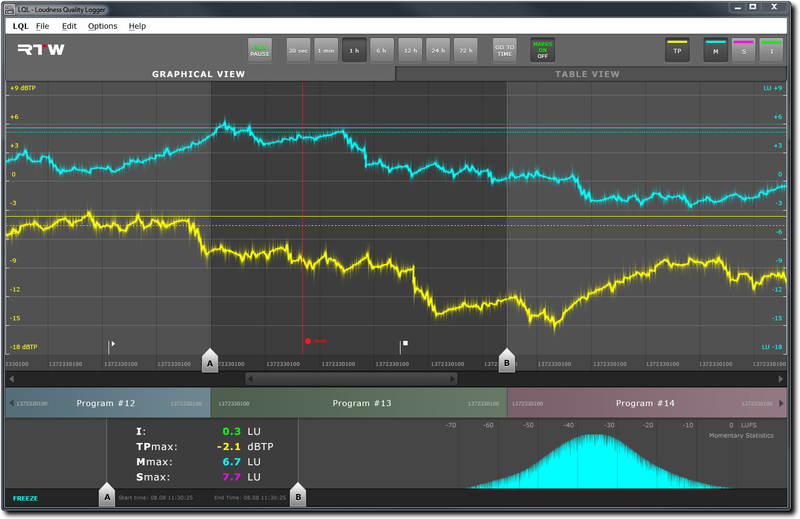 The LQL license (SW20014) is a natural extension of RTW’s range of innovative software options for the 7- and 9-inch line of TouchMonitor audio meters. RTW executives will be on-hand to demo and discuss this new software at the company’s IBC stand. 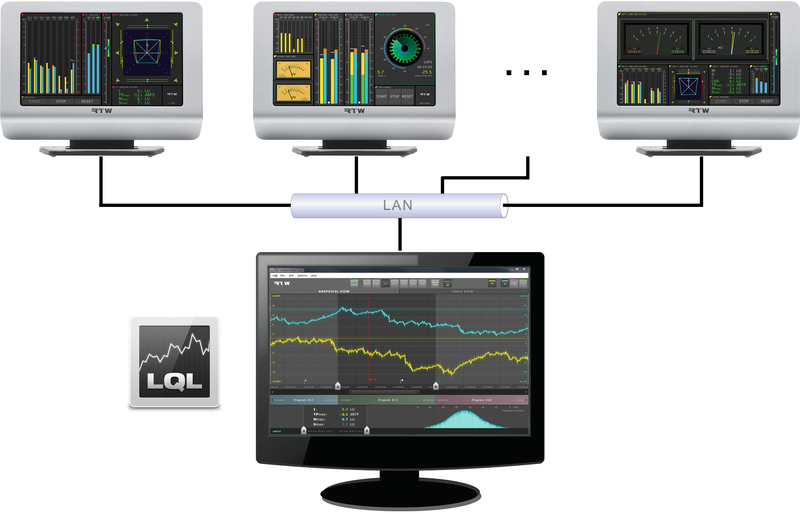 LQL enables data to be derived directly via an IP-connection from a capable TouchMonitor audio meter, as well as from external storage media such as a USB stick. Also included in the software are dual limit weighting, status information, marker and various other reporting features. The new PC software is free of charge to users, however the SW20014 LQL license is required to enable a TM7, TMR7 or TM9 series meter to be compatible with data export and additional display functions. The TM7 and TM9 series TouchMonitors, which include the innovative Magic LRA instrument, feature a 7- and 9-inch touch-sensitive display, respectively, and provide unparalleled flexibility and modularity, combined with intuitive control. The software visualizes multiple sources simultaneously. Both support displaying the same signal on multiple instruments in parallel, each with dedicated defaults with both horizontal and vertical operation. TM7 visualizes up to 40 sources at the same time, while the TM9 visualizes up to 48 and the TMR7, specifically designed for radio broadcasting, visualizes up to four. 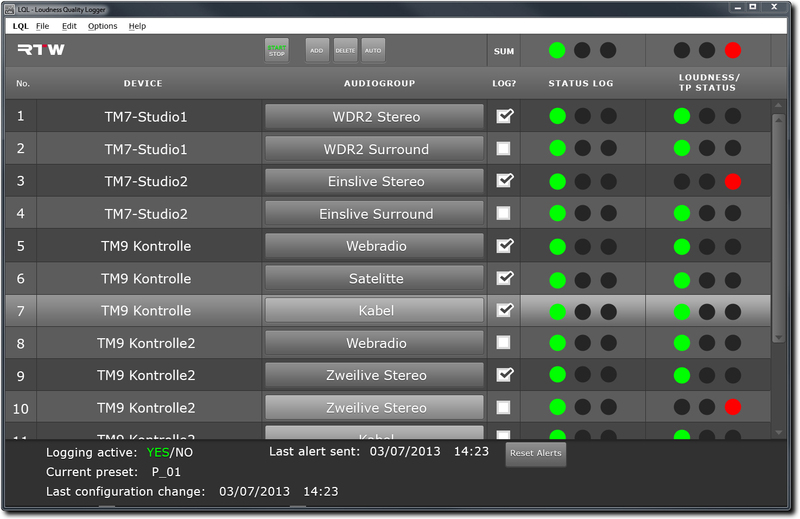 Various audio interfaces and combinations are available i.e. analog, AES3, AES3id or 3G-SDI. RTW’s entire TouchMonitor range was created to help adhere to all major industry loudness standards, including EBU R128, ITU BS.1770-3/1771-1, ATSC A/85 and ARIB. RTW’s range of products currently include the SurroundControl series for monitoring, controlling and routing stereo, multichannel and surround audio and the TouchMonitor range, which truly marks a paradigm shift in visual audio monitoring and loudness metering. Combining maximum flexibility and modularity with an intuitive touch-enabled surface and multichannel signal analysis, the -Touchmonitor units are the essence of many years of experience. The attractively priced TouchMonitor TM3 entry-level system opens new markets, targeting applications such as journalist cubicles, edit suites and small control rooms.